"...of the many words, and numerous books written about this American icon over the years, none of them are quite like this one. 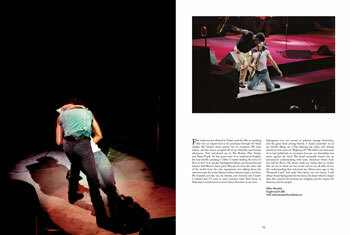 In For You editor Lawrence Kirsch has assembled hundreds of amazing photographs taken by the fans themselves, and covering every phase of Springsteen's extraordinary career, into a beautiful coffee table book. Accompanying the photographs, are personal stories told by the fans - usually recalling memories of a favorite tour or show." 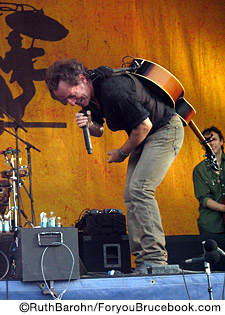 Bruce Springsteen - rock poet, musician, live performer - The Boss has become a legend in his own lifetime. In fact, he has earned a well-deserved reputation as one of the greatest live concert performers ever. 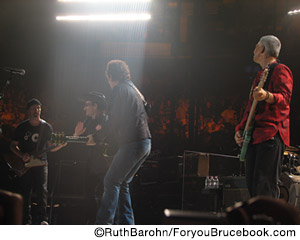 Through his records, CDs, DVDs and especially his performances, Bruce has touched millions of people from around the world for whom his music has been accessible, devotional, spiritual and most of all, inspirational. Springsteen's fans are legendary in their own right and are renowned for attending multiple concerts in multiple cities around the world. the person reading this, who perhaps just finished or is commuting to a long day at work, wondering how you will ever measure up, questioning yourself far more often than you give yourself a pat on the back. Or perhaps you have derived enough comfort from the music, and life itself, to achieve something unshakeable. No matter: Either way, you are part of this story. Without you, it does not exist. And here is the beauty of what it means to be a Bruce fan: Once you find yourself touched by his stories, you can't help but want to share your own. That is what I, and many other Bruce fans, have done in the pages of this book. If I had a wish for any of the authors here, or for myself, it is that we may be fortunate enough to thank Bruce in person someday." 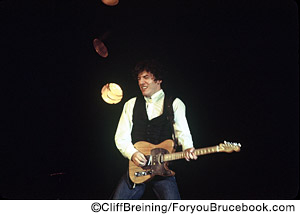 Not only is the new Bruce Springsteen book For You brimming with his fans' fond memories, it is also a sumptuous full-colour photographic archive volume of this legendary performer. The simply designed and reproduced photo collection features well over 400 colour and black-and-white photos-most of them never seen before. 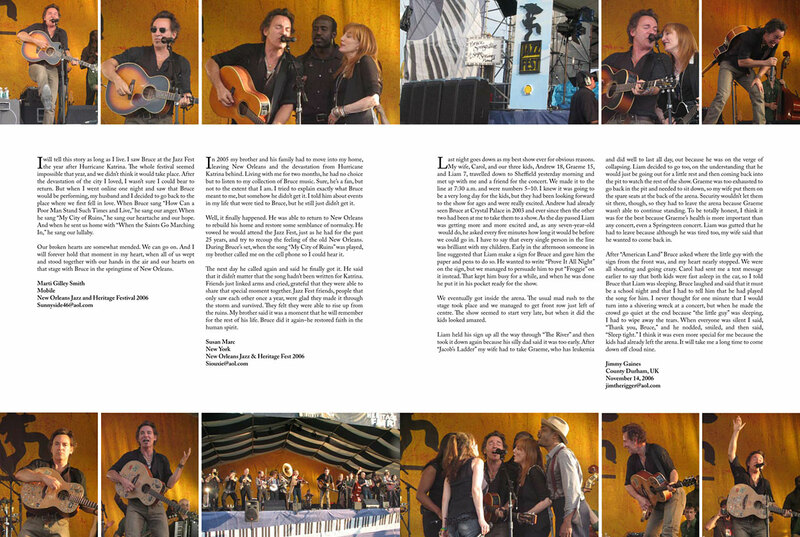 They illustrate and enhance the personal stories of the fans, whose stories were chosen as representative of a whole spectrum of personal experiences, submitted for publication from the worldwide Springsteen fan community. 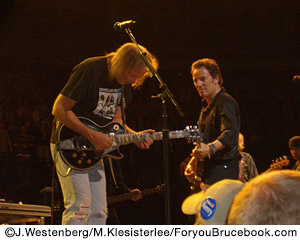 From the early days of Steel Mill until the 2007 All Star Tribute at Carnegie Hall, For You - the book details real life journeys undertaken by Bruce Springsteen's amazing and deeply committed fans. "What we need is a little respect"
What becomes extremely evident, however, as you read these stories, is there is one overriding sentiment differentiating Bruce Springsteen's relationship with his fans from that of almost any other performer. This is the incredible respect he holds for them, along with the phenomenal access and interaction he has always afforded them. It was noticeable right from the very beginning of his career in New Jersey, New York and Los Angeles, and it continues to this day. 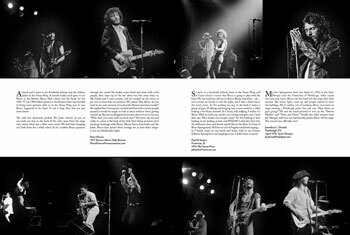 From Boston to Barcelona, Milano to Montreal, New York to New Zealand and Asbury Park to Amsterdam, For You - the book - reveals what makes Bruce Springsteen fans accord, and demonstrate, such a high level of devotion to their hero; it is a loyalty given to few other performers. Discover for yourself the amazing, original photography taken by fans from almost all of the classic tours and concerts. On the pages of this book, on stage, off stage and back stage, we have it covered, in terms of both words and images.